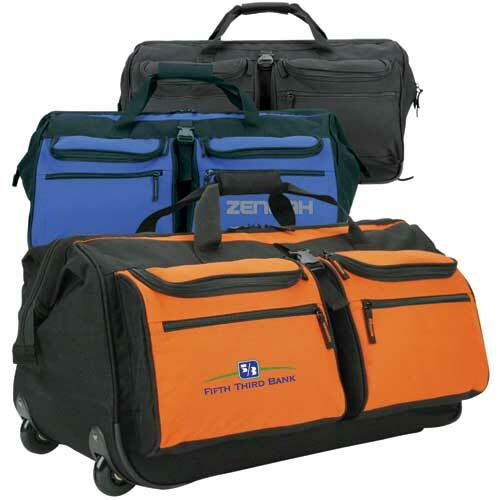 Wide-mouth rolling duffel bag made of 600 denier polyester. Spacious zippered main compartment with easy access wide-mouth opening. Twin zippered front compartments with zippered front pockets. Hidden retractable pulling handle. Heavy duty frame with skate rollers. Padded hook and loop grip handles. Size: 25 " x 15 " x 13 "
Price Includes: up to 5000 stitches and 5 thread counts.